The Wrap-Aholic! Blog: Customer Service-Don’t Be Afraid To Go Above And Beyond! Customer Service-Don’t Be Afraid To Go Above And Beyond! "Loyalty" is a word that you don’t hear often, and rarely experience in today’s day and age. At Wrap-Aholic! we strive to do business with our customers whenever possible. One of our favorite clients is O’Reilly Automotive. We have been doing their vehicle wraps and graphics for years, and have grown very fond of the relationship that we share with them. Kyle Jenkins, the owner of Wrap-Aholic! asks his employees to please buy all of their automotive supplies at O’Reilly. I even buy all of the parts that I need from them when my truck is in the shop getting repaired, to make sure that O’Reilly gets my parts business. Tom and Barbara Kelley at Kelley’s First Choice Automotive know that it cuts into their profits when I buy my own parts, but they humor me because they appreciate my loyalty. Phillip at O’Reilly Automotive is a stellar employee. If all employees were so diligent, businesses would never fail. How are your employees treating your customers? Do you ever hire a shopping service? Perhaps you should. I have been working with Kyle and Wrap-Aholic! for over 3 years now. I named and branded his business for him when he wanted to change the name from Truck Sign Design to something more catchy, that would let the masses know how passionate his company is about vehicle wraps. I am proud of the quality of the vehicle wraps and graphics, and the character of the employees. It makes my publicist job easy when I know that every customer will be THRILLED for choosing Wrap-Aholic! You can throw a rock and hit a sign company, but you would be hard pressed to find one that comes close to the high quality and integrity of Wrap-Aholic! 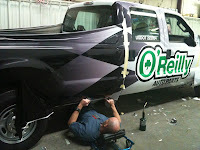 We’d like to think that we are the “O’Reilly Automotive” of Vehicle Wraps and Graphics. And based on my recent and continued experiences with O'Reilly Automotive, that is very high praise. Be "stellar," and surround yourself with greatness.